Pinot Noir by Lethbridge of Geelong. A sweet cherry and briar flavoured palate with hints of clove. Lethbridge was originally planted to vine by Swiss immigrants circa 1874. All harvesting is done by hand, grapes are crushed and destemmed, a portion is included as whole bunches. Quality, without compromise, a European accented wine with the focus on balance and texture, made for enjoyment alongside good food. Lethbridge Wines grew from a friendship between Adrian Thomas, Ray Nadeson and Maree Collis. All three were busy establishing careers in science and medicine and shared a love of great wine which grew to be an obsession. Soon the afternoons sipping burgundies were replaced by weekends searching for the perfect vineyard site and then by afternoons digging holes and planting vines. For two of the partners (Maree and Ray) the passion for wine drove them to a sea change, and in 2003 after 7 years of balancing careers in science and running a vineyard and winery, they made Lethbridge Wines their reison d'etre. Maree Collis and Ray Nadeson are not your average winemakers of a boutique winery. Both were initially trained as research scientists and hold PhD degrees in chemistry and medicine, respectively. While combining their scientific careers with winemaking, Maree and Ray completed the winemaking degree at Charles Sturt University. 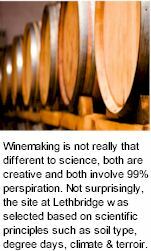 Winemaking is not really that different to science, both are creative and both involve 99% perspiration, 1% inspiration. Not surprisingly, the site at Lethbridge was selected based on scientific principles such as soil type, degree days and other climatic indicators, yet when the three partners first explored the property they discovered an ancient old wooden fermentation vat in one of the old sheds. Discussion with the previous owner (Ivor Perdrisat) revealed that his family, Swiss in origin, had planted a vineyard on the exact site back in the 1870's before the discovery of phylloxera in the region. The old wine vat has been reincarnated as a beautiful timber tasting bench in the cellar door. This story is compelling in the connection between traditional wisdom and modern science. 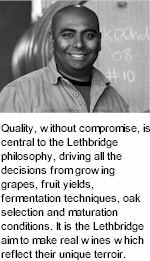 Quality, without compromise, is central to the Lethbridge philosophy, driving all the decisions from growing grapes, fruit yields, fermentation techniques, oak selection and maturation conditions, and all the way through to packaging and promotion. It is the Lethbridge aim to make real wines which reflect their unique terroir (soil, climate, aspect and bio-diversity). The goal is to create European accented wines which focus on balance and texture, made to be enjoyed with food. Environmental sustainability is considered in all levels of production. Lethbridge seek to differentiate themselves; to be unique, innovative, experimenters and risk-takers, whilst remaining committed to the highest standards of quality and integrity. By capping annual production, Lethbridge will continue to produce wines of great quality and individuality. The fruit comes from the Estate Vineyard in Lethbridge, originally planted in 1874 by Swiss immigrants (replanted by the current owners in 1996), and from another historic vineyard site in Mt Duneed, an area first planted in 1858, and the first vineyard to be replanted as the Geelong region re-emerged in 1970. To maintain true expression of terroir, Lethbridge keep the wines made from different vineyards and even from different blocks (soil types) within a single vineyard separate. So just what does biodynamic mean? The essence of the method is based on the premise that the vineyard is a living, closed and self-sustaining ecosystem. This is an easy enough premise to accept, particularly for winemakers who believe that terroir is one of the most essential ingredients of a great wine. Biodynamic farming is an agricultural system with its roots in a philosophy. It was conceived by the Austrian philosopher/ scientist Dr Rudolf Steiner and has much in common with organic farming. Where it differs is in the use of special preparations and in the timing of their application based on the phases of the moon. Our forebears believed that the moon and sun rhythms, along with celestial events, seemed to affect plant growth and formation - thousands of years of experience cannot be easily discounted. More recently, biodynamics was considered a fringe activity pursued by crazy moon-gazers. The relationship between lunar cycles, soil and seasons is still a mysterious, misunderstood one. But a list of biodynamic wine producers reads like a who's who of the world's best wines. Domaine de la Romanée Conti, Domaine Trapet, Domaine Leroy and Domaine Leflaive in Burgundy; in Alsace, Domaine Marcel Deiss, Albert Mann, Josmeyer, Domaine Weinbach, and Domaine Zind-Humbrecht. In the Rhône, Chapoutier and Tardieu Laurent. In the Loire, Didier Dagueneau, Domaine de la Coulée de Serrant and Domaine Huët. Australia also has its exponents including Cullen, Henschke, Jasper Hill, Castagna and Carlei. All these producers are driven by belief that biodynamics is better for the soil, the environment, the vines and the wines. With advocates such as these, who are Lethbridge to disagree!